When observing early walking pre-school toddlers within nursery settings, it is easy to appreciate that in excess of 2,300 steps per hour are accumulated, with children walking more than 2.6 miles per day within a playroom setting. This figure increases in children when walking becomes more confident, and risk of falls diminishes. It therefore becomes difficult to imagine how this energy and movement can be accommodated, when minimum space standards for New Early Years Centres are being applied. Recognising the significant investment being made in early years provision in Scotland, Holmes Miller has questioned whether a ‘metric led’ approach to design will derive the optimum environment for pre-school education, and challenge local authorities to consider an ‘experience based’ accommodation schedule to create a truly immersive learning environment. In short, the area metrics for Early Years expansion relate directly to the funding mechanisms upon which these projects are being procured. They are vital to the quantity surveyors and programme managers involved at strategic level, formulating the Capital Plans for Scotland’s local authorities, to fund these projects – and these are the disciplines that rely on this benchmark data to provide them with a basis for supporting an Early Years Expansion Programme. This however, is where the function of ‘the metric’ should end, and in the context of delivering innovative learning environments, should be the hidden cost mechanism, not the governing factor dictating these projects. Application of ‘the metric’ should therefore have little influence over the educationalists, teaching staff, architects and designers involved in the 1140 hours programme, and the notion of directly applying a square metre per child ratio to the design of an Early Years Facility directly contradicts the documented best practice and published learnings of key educationalists, stifling opportunities for development of a child’s self-esteem and self-confidence, along with their physical, social and personal awareness skills. In considering a template for Early Years provision for local authorities, two immediate typologies are identified, both offering a model for learning, and at polar opposites from the perspective of a built solution. Utilising a ‘metric led’ approach will ultimately derive a functional built form that offers the maximum permissible internal floor area whilst aligning with the project cost parameters. The benefit of this approach is that a building arrangement is generated that aligns with the preconceived ideology of how an authority controlled educational facility should function. Aspects such as an entrance lobby, waiting area, administration suites, meeting rooms and circulation areas, coupled with security zones, plant spaces, server rooms and facilities management are arranged around the infant playrooms, and provide a facility that local authorities are adept at managing and offer parents the surety that their child is protected. This methodology should not be dismissed, as there are numerous examples that offer innovation in their design and delivery. Holmes Miller has developed a solution that brings all the benefits of off-site manufacture, to provide Councils with a flexible solution that can be expanded to suit anticipated pupil rolls, and delivered efficiently, whilst aligning with expected cost metrics. This option can be customised to suit context, with a range of cladding solutions possible, and the large volume playrooms can be easily defined to marry with an early year’s curriculum. The conflict in this ‘metric led’ approach however, is that a building is formed that creates on average, 2.2 square metres of ancillary and support accommodation, for every genuine square metre of play space. Coupled with this, continual pressure on project budgets can often lead to resultant playspaces resembling functional primary school classrooms, efficient in design and the delivery of a lecture based curriculum but institutional in aesthetic, and ineffective in catering for the wide ranging developmental needs of preschool children. The alternative approach is to utilise the area metrics to set the upper limit on project value, and thereafter, develop an ‘experience based’ accommodation schedule, that considers the type of spaces that are needed to support a pre-school curriculum. This review would assess whether these spaces need to be indoors, in sheltered enclosure or outdoors, along with key adjacencies, with a view to generating a creative landscape for pupils to inhabit and explore. It also ensures that children remain active throughout the nursery day, with activities occurring in different zones that they can move freely between. From a local authority perspective, this Early Years model can become a key step in adopting the principals of the outdoor and woodland nurseries, where children are encouraged outdoors as often as possible, with the familiarity that stems from a built facility, and the associated security that it brings. In considering a notional 100 place early years centre, the ‘metric led’ approach would deliver a facility of 580m², of which approximately 240m² would be viable teaching + playspace. The alternative approach, through rationalising the true requirement for indoor space, could offer a facility of 1030m², with 240m² of registerable indoor playspace, along with a further 550m² sheltered, multi-level activity space that can be used throughout the year. 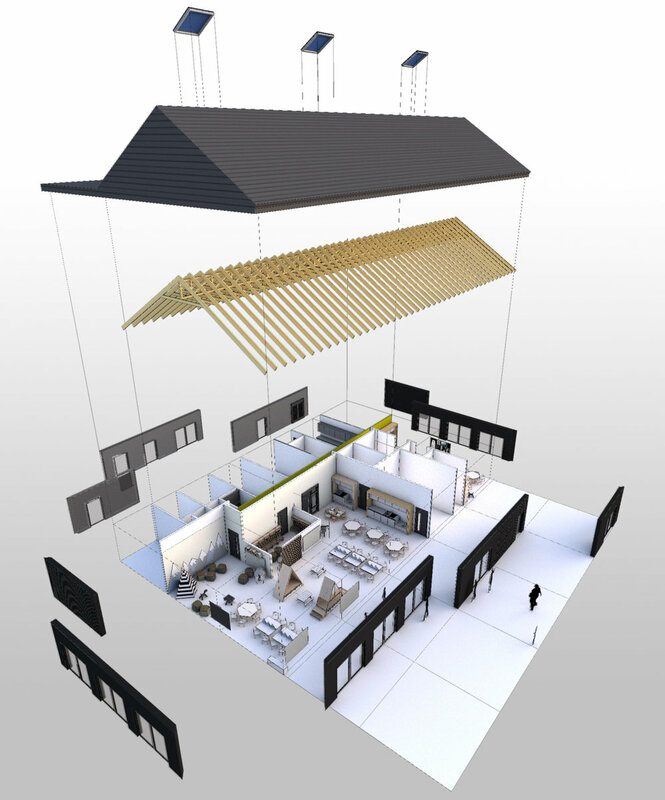 - Interconnected playrooms grouped around a central courtyard, with flexible partitions to allow the spaces to adapt to suit teaching activities, dining and sleeping. Formed using an efficient modular design, these indoor playrooms will use natural materials to create a calming environment, whilst fully sliding doors effortlessly connect between inside and out. - A vibrant and dynamic nursery courtyard, fully undercover and protected from the elements, this space offers children the opportunity to run, jump and explore, outwith the playroom setting, in fresh air. This space is designed to provide children with exposure to a huge range of experiences. 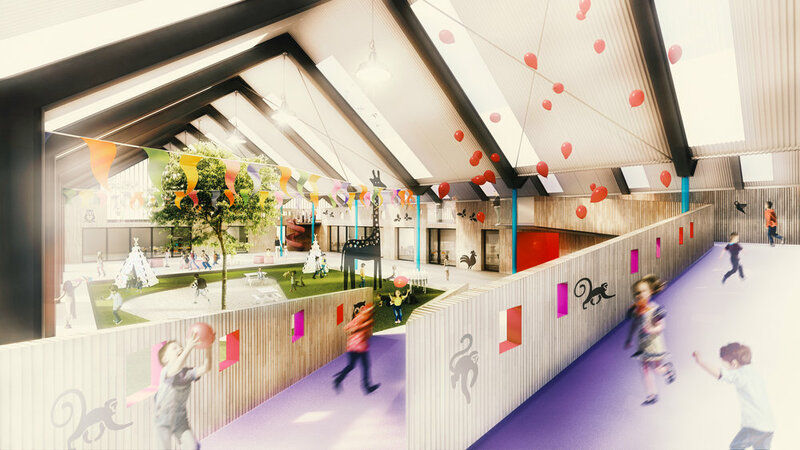 The ramps to two sides of the courtyard allow pupils to run onto the roof of the playrooms and experience an elevated view over the nursery. The lightweight roof of the courtyard will transform the environment of the nursery with the weather patterns, with lightning illuminating the space, rain drops filling the space with noise and sunlight casting shadows across the ground. The scale of this space will allow Early Years staff to create a multitude of experiences for children, offering tents and tipis as reading corners, indoor planting areas that form small winter gardens, material areas to allow construction, water play and craft skills to be taught on a far larger scale and growing areas where soft fruit and vegetables can be planted. Principally however, the courtyard is an active space where children can move freely. The open sides to the enclosure will allow the noise of pupils to be heard across the surrounding neighbourhood, integrating the building as part of the community. - The landscape surrounding the early years centre would be equally as engaging, with a series of ‘low-tech’ interventions designed to bring educational benefit. Rainwater would be collected and used within the garden areas, or distributed through a surface swale to form a wetland garden. Linked to the bin store would be a composting area, allowing organic produce to be reused within raised beds. The landscaping would offer a range of textures and surfaces, with ‘risk elements’ introduced, such as climbing trees, mounds and tunnels to allow children to develop their self-confidence and agility skills. A fire pit, activity lawn and decked areas will offer practical spaces for outdoor learning to take place, bringing the key lessons from woodland nurseries directly to urban and suburban local authority centres. - The permeable nature of the building will allow parents on arrival and departure to see and hear first-hand, the activities and challenges their child is facing. Linked with this, an enhanced entrance area provides a space for pupil profiles to be stored, along with direct access to a small meeting area. This arrangement would allow parents to read through their child’s progression notes at collection time, and have a conversation with teachers and staff on an informal basis, encouraging pupil development to extend to the home, and offering a support structure without stigma. Who cares about metrics? We don’t, but we have an acute understanding of the financial mechanisms behind these projects, and can utilise this investment to deliver the optimum solution for Scotland’s authorities. 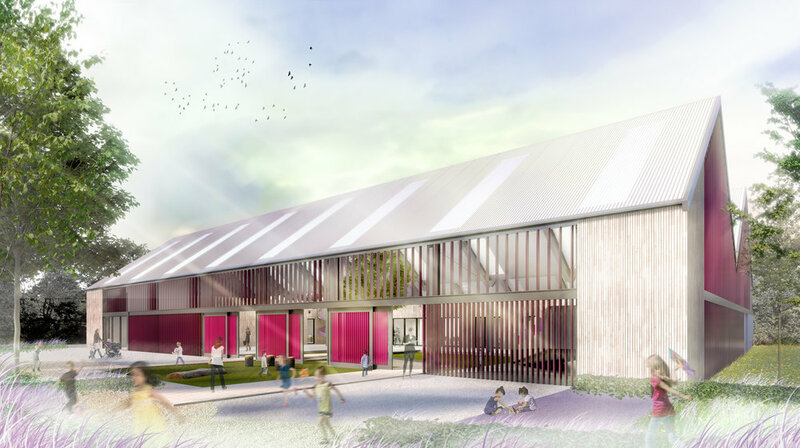 The 1140 hours commitment offers an unrivalled opportunity to sculpt the delivery of pre-school education for generations to come, and we are passionate to ensure that these new buildings are designed to offer a truly immersive early years’ experience. Contact our education team to discuss further.